Growing arugula in a container is fairly easy. The slightly spicy, delicious green comes with a bonus in that arugula flowers are beautiful and edible. Since the roots of arugula are relatively shallow, you don't need a giant or particularly deep container. 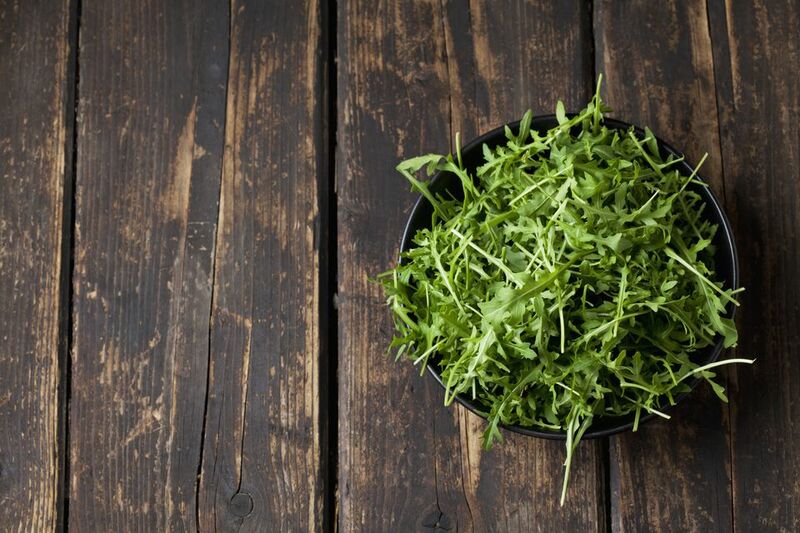 You'll want to plant a fair amount of arugula because once you get a taste for it, you might find you're eating a lot of it. Though you can grow arugula in almost anything, a self-watering container works particularly well. Like most salad greens, arugula seeds are tiny, so you have to be careful not to plant them too deep. Fill your garden pot up with potting mix, then gently flatten it out with your hand. Distribute the seeds as uniformly as possible onto the potting mix. Using your palm, gently pat the seeds onto the soil. You can then cover them lightly with potting soil, or put a thin layer of seed starting mix over the seeds, gently patting again. Add water carefully, either using a rose attachment or a gentle spray from the hose. You don't want the water pressure or weight of the water to disturb your seeds and drive them too deeply into the soil. Plant your pot in full sun, or for a longer season, give arugula mid-day shade. Arugula doesn't love hot weather and gets quite bitter if grown when it's steaming hot outside. Plant arugula seeds as soon as danger of frost is over, and begin to sow once a week or every two weeks to keep a constant supply. Keep the soil evenly moist until seedlings emerge, which will take from 7 to 14 days. When the seedlings are about an inch or two tall, thin them so they are 1 to 3 inches apart. These young leaves are some of the most tender. Although you should thin the seedlings, sometimes arugula will grow regardless of whether you leave it crowded. Your arugula should be full grown and ready to harvest in about three to four weeks. The younger the leaves, the more tender and sweet they will be, so don't wait too long to start picking them. Once the seedlings are 3 to 4 inches long, you can either pull out the whole plant or, if you want the plants to continue to grow, you can collect just the leaves by cutting or tearing them off toward their base. Be aware that if you pull out the plants, the dirt can get on the leaves. Arugula flowers are a little sweet and are not as spicy as the leaves. The flowers appear after the leaves have grown to full size and are too bitter to eat. If you don't harvest your arugula, you should see flowers. Pick the flowers off and eat them or add them to a salad or an open-faced sandwich for a beautiful treat. You can also grow some arugula for the flowers alone.